There are collaborations and there are COLLABORATIONS. This summer, TRESemme has teamed up with Rhett Eala to gift is loyal customers a piece of fashion every time they protect their hair from immense damage caused by splitting. How so? 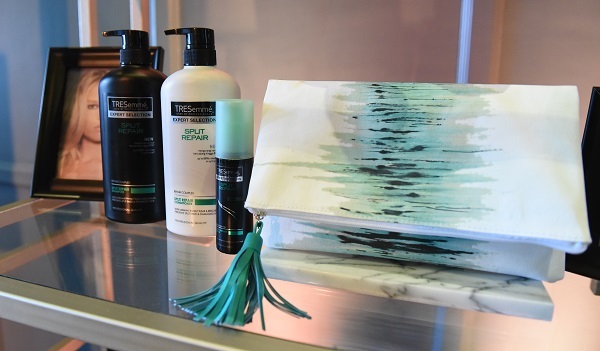 Inspired by the new TRESemme Split Repair range, Rhett Eala crafted the versatile clutch below. The sherbet toned brush strokes against ivory white canvass was actually drawn by brushes made out of human hair that's treated with TRESemme. After treating the split strands with TRESemme Split Repair, each strand was bound to up to 88% and came out to be salon gorgeous hair with less split ends. Gone are the days when the only remedy for split ends is a haircut. TRESemmé Split Repair is an innovative new range by the brand known for salon-grade and stylist-tested hair products, which allows you to wear long salon gorgeous hair, without the trouble of split ends. With its revolutionary sealing mechanism Repair Complex, TRESemmé Split Repair binds up to 88% of split ends, while repairing and preventing further damage with continued use. Just as all TRESemmé products are used by professionals, the NEW TRESemmé Split Repair range was tried and tested by the industry’s top hairstylists. For this exciting new line, hairstylist to the stars Lourd Ramos and his team did the Brushstroke Test to show proof of its split end repair. Two brushes were made out of human hair; one was treated with TRESemmé while the other was not. These same brushes were then used to paint brushstrokes to show the difference salon results can make. With TRESemmé, you get finer and smoother strokes – proof to its split end binding technology. Now, you can have long, salon gorgeous hair every day. TRESemmé Split Repair is available in leading supermarkets, department stores and drug stores. To learn more about the latest salon innovations, follow them on Twitter (@TRESemméPH) with the hashtag #SalonGorgeous.